One of the most popular of the echinacea varieties, the Magnus purple coneflower is a strong bloomer from June to August in most regions. Removing the spent flowers of the Magnus not only clean up the plant, but encourage another flush of flowers to develop. Cut off remaining blooms in late summer to early fall for autumn bouquets or leave them on the plants to develop seed pods to feed the birds over winter. 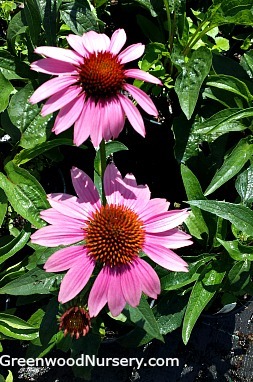 Coneflowers are deer resistant, drought tolerant, good for butterfly gardens, bee gardens, rock gardens and for dry soil. Plant Magnus Echinacea with companion plants like the Blackeyed Susan, Shasta Daisy, and Golden Baby Solidago. Magnus Coneflower is grown in 3.5 inch pots. Orders shipping to AZ and CA will be bare rooted before being prepped for shipping.